Taking care of your firewood is an important part of taking care of your fireplace and chimney. That's why you need to invest in a Black Painted Steel Log Rack Bracket Kit this season to keep your firewood in tip-top shape. A quality log rack protects your firewood from rot, termites, and other insects. It also keeps firewood dry for a safe, consistent burn in your fireplace. This adjustable log rack is made of heavy-duty steel with a powder coat black painted finish to help resist rust. It is ideal for elevating your firewood and providing the proper ventilation to keep it in excellent condition. Best of all, you simply add 2 x 4 boards to customize the log rack to your specifications. 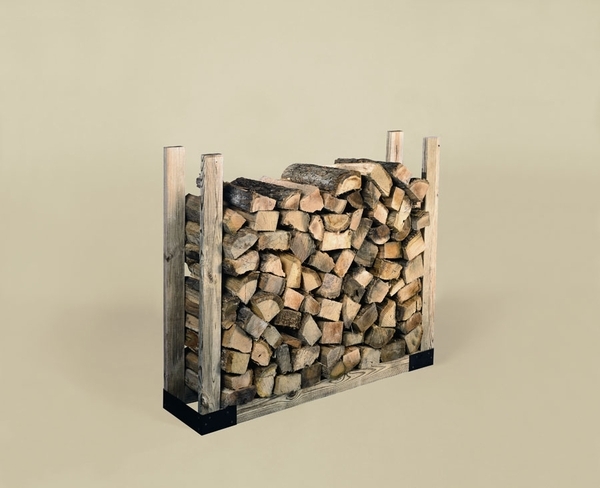 A log rack is not just an accessory, it's a part of your cold-weather daily routine. The Black Painted Steel Log Rack Bracket Kit is the perfect way to keep your wood supply in perfect condition for years and years. Please Note* The 2 x 4 boards are not included with the purchase of this adjustable log rack kit. Will this work with vertical 2 x 4's of 90" lengths? This rack can be used with 2 x 4's of any length. It is completely customizable. The product was received very quickly and I am a very happy customer. I cannot recommend this design for long spans of stacked wood. For several years I have had six of these racks extended to twelve feet. The 2 X 4 that is supposed to support the height of the wood bows under the weight of the stacked wood and can come apart. Perhaps these would work fine for shorter widths, but there are better options and better designs for those needing the longer widths. Because I was in a hurry I made this purchase at a local hardware. I am skeptical that it is going to actually hold up under a load of wood. The installation process was very frustrating because the construction seemed fragile and the screws not sufficient for the task. Parts were hard to keep together. I wish they would have had better brackets. If you need to stack a large amount of wood, but don't want to spend a fortune doing it, you may really like these brackets. They are made of good quality and should last for many years. Well worth the initial investment! Fast shipping receives an A+. I have bought three log racks from your website in the past, giving one of them to my son. This bracket just came and I set it up in my garage. I believe it is going to work just great. It gets the wood up off of the floor, and I can clean all around it with no trouble. I am a very happy customer that will be sure to recommend your products. I was expecting this product to be heavy duty as advertised, but I have been disappointed. You assemble this rack with screws, and it doesn't seem nearly as sturdy as the racks that use an interlocking system. It probably won't last as long or keep my wood as dry and clean because the rack sits directly on the ground. I just don't like the design of this rack. I would recommend spending just a little more money and getting a product that will serve you better.